BERLIN - Defense is one of the biggest question marks for the Berlin football team coming into the 2018 season. 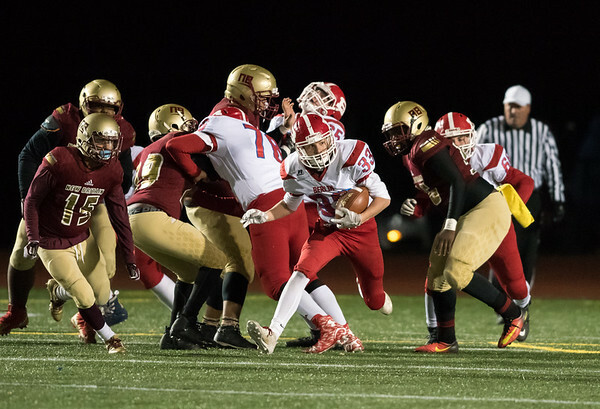 After losing defensive lineman Kevin Starfstrom, defensive back Matt Wojciechowski and linebacker James Mazzarella, the Redcoats have been in search of key contributors to fill those spots. Junior Danny Lynch showed potential early in the 2017 season, as the outside linebacker had 19 tackles. He will be stepping in as a new starter this season, along with Larry St. Pierre, as he moves from linebacker to strong safety. Senior Tyler Dinkins will grab one of the cornerback slots. Dinkins recorded 35 tackles in four games last year. Sophomore Marco Scarano will also be stepping into a new position as outside linebacker. All eyes will be on Scarano. Last season he collected eight tackles and deflected two passes. But Zach Hrubiec will be paving the way just as he did last season. He posted 77 tackles, 28 of those for a loss, a year ago. Hrubiec has already drawn interest from a number of Division I colleges. Posted in New Britain Herald, Berlin on Wednesday, 5 September 2018 21:27. Updated: Wednesday, 5 September 2018 21:30.